Tuesday, Nov. 3, 2009 at 8:33 p.m. The early exit poll results indicate that financial concerns weighed most heavily on voters’ minds as they went to the polls today. 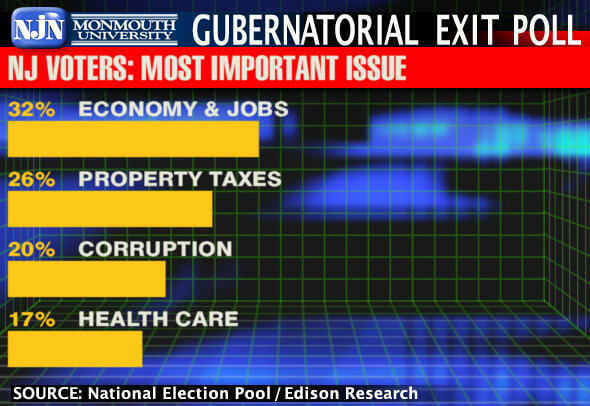 Leading the list of issues in vote for governor today was the economy and jobs at 32% and property taxes at 26%. They were followed by corruption at 20% and healthcare at 17%. But voters’ top issue depended on who they supported today. Among Christie voters, 38% named property taxes and 29% focused on corruption. But among Corzine voters, the economy and jobs was the number one concern of 44%, followed by health care at 30%. “One of the reasons why property taxes is polling lower now than pre-election polls is that the pre-election polls asked what issues the voters most wanted to hear about. The exit poll asked which issue factored most in your vote. Since the two main contenders avoided this issue like the plague, many voters had to search for another issue on which to base their decision,” said Patrick Murray, director of the Monmouth University Polling Institute and exit polling analyst for NJN News and Gannett New Jersey. Among those who named property taxes as their top issue, 67% voted for Chris Christie, 25% voted for Jon Corzine, and 8% voted for Chris Daggett. The Republican did similarly well among corruption voters. It’s a different story, though, for voters who were most concerned with the economy and jobs. This group went decidedly for Jon Corzine by 58% to 36% for Chris Christie and 5% for Chris Daggett. Corzine also took the overwhelming majority of health care voters. Editorial note: I have heard some questions about why education, the budget, and others issues did not come up as voters concerns in the exit poll. Especially since they made the list in pre-election polls. Well, there was a difference in how the questions were asked. Most pre-election polls, including Monmouth/Gannett, asked the issue question in open-ended fashion, i.e. “Name your top issue.” The exit poll however made voters choose from among only four: property taxes, economy & jobs, health care, and corruption. Some have noted that corruption came up somewhat higher in the exit poll than in the pre-election polls. My personal view is that some “government spending/budget” voters chose “corruption” as the choice among the four that came closest to their own concern (i.e. “waste fraud, and abuse”). In fact, I had strongly suggested to the Exit Poll group that they should add a fifth category (“government spending”) to their list. So, we’ll have to live with the supposition that the “corruption” number in the exit poll also includes voters most concerned with government waste in general.